Improve Your Photos - Take better pictures of you and your friends at better distances and angles. 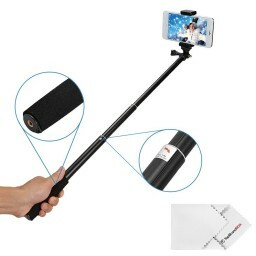 No more hard times when taking a photo of too many people or the view behind you. 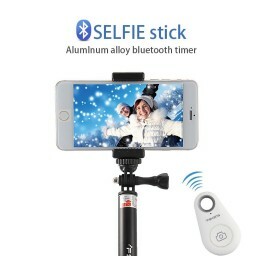 Capture This Moment From a Perfect Angle - The smartphone holder has two screw holes and can be screwed to the stick vertically or horizontally. Rotatable for 360 degrees free control. 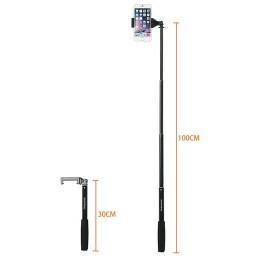 Extendable length up to 100cm (39 inches). Comes with a Bluetooth shutter that can be controlled at a distance up to 10m. Very Tight Holder - No more worries of falling. 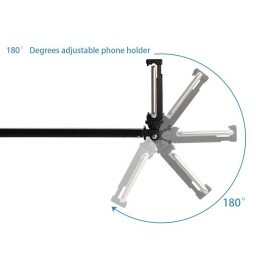 The holder can be adjusted to hold various sizes of smartphones firmly with its dentate clamp and thickened non-slip rubber wrap. Easy To Use - Fit the phone to the holder. Pair the phone to the Bluetooth shutter. Adjust it to a preferred angle and distance. And then enjoy shooting your photos! Good Looking and Endurable - Environmental non-toxic soft sponge handle for secure and comfortable hand feeling. Aluminium alloy telescopic tube with shiny color and flexibility.